The opportunity to choose should be right at the top, in any case no law can stop a woman from terminating. Pakistan one of the most conservative countries on the planet has more abortions than countries where abortion is legal. Unfortunately most of the abortions in Pakistan are unsafe. That is what happens when you restrict safe abortion. You make it dangerous but do not decrease it. 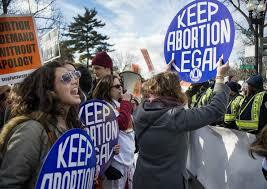 Safe abortion should not even be debated.